"I embrace the challenge of creating functional and aesthetically pleasing solutions to address my clients' storage needs. My clients enjoy the tangible benefits of our systems, but I am most gratified by providing them with a sense of order and tranquility as they become organized. My favorite thing about being a designer for Closet Works is that I meet with wonderful people, and I visit beautiful homes throughout the Chicago metropolitan area. Each project and each client are unique! I firmly believe in the Closet Works philosophy of creating "Raving Fans", and I aspire to provide each client with premier customer service and precise attention to their needs and objectives." 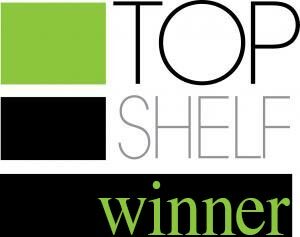 Each year, Top Shelf Closet Design Awards are given to honor designers for their creative closet and home organizational designs. 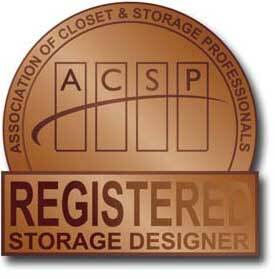 This is the highest award given in the closet design industry. Greg Cetera was honored with this award in 2017 for his work in designing a unique storage solution for a reclaimed attic space pressed into service as baby's nursery and closet. 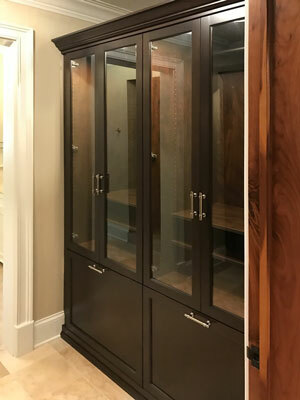 He was honored again in 2018 for a spectacular two piece wardobe closet for a bedroom with a cathedral ceiling. 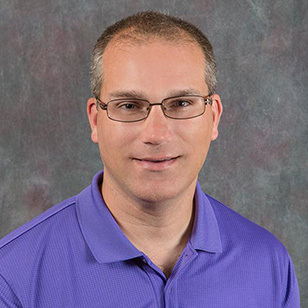 Greg is a veteran closet design professional, working with Closet Works since 1999. He is certified by the ACSP, and is an officer of this professional organization. 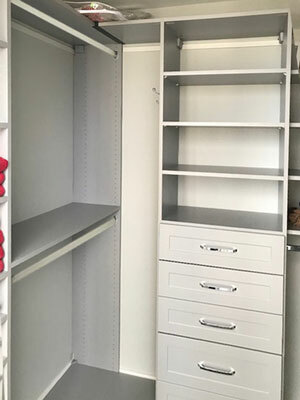 This wardrobe closet design became a beautiful, brilliant solution to more than a handful of issues this couple was facing in this particular room. Construction details and special considerations to all facets of the room including the HVAC system, the vaulted ceiling, and personal storage needs were all kept in mind and resulted in this expansive and elegant design. This walk-in closet design is fit for royalty not only because of the obvious elegance but the functional details of the project. 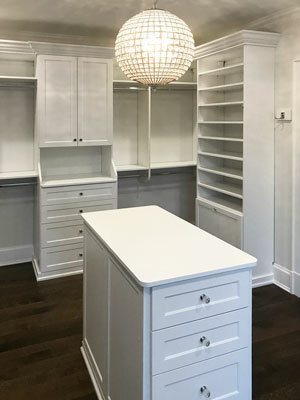 From the all-wood components, custom lighting, closet accessories, and spacious hanging and shelving, this closet is both a dressing room and wardrobe palace. This walk in design was created with floor-to-ceiling shoe shelves with shoe fences to offer an amazing way to organize while looking like you have your very own personal boutique. The system is in ivory to give the design a soft, feminine look to pair with the ornamental wallpaper in the room. 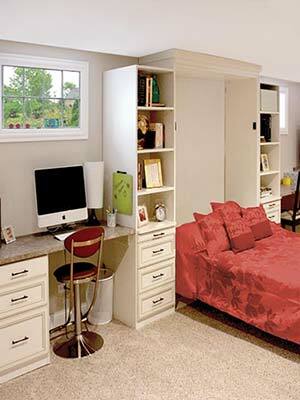 This closet design provides ample storage for the wardrobes of two adults. 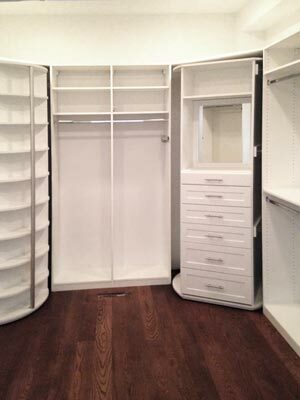 Custom closet cabinetry with doors above the medium hang section along the back wall is perfect for less frequently used items. The doors keep dust out, but the items are still accessible. 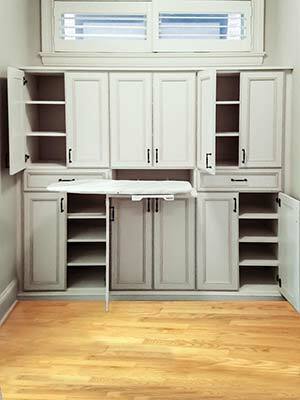 The dual level center storage island is the pièce de résistance in this closet. The drawers provide plenty of storage for small items such as lingerie, scarves, etc. so that the owners don't need a typical dresser in the bedroom. A shared space like this one leaves both occupants right in the lap of luxury. 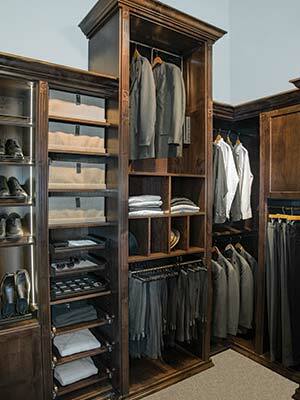 With two closet islands, custom LED lighting, and extensive organization systems, this closet is truly a masterpiece. A separate corridor off the main closet offers additional storage behind elegant glass cabinets. Built in synergy hampers provide a space for the couple to discard of laundry without taking up any valuable space in this beautiful design. 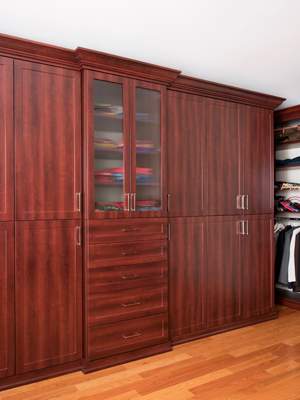 This walk in closet with drawers has an overwhelming sense of tranquility — becoming a soothing oasis for your wardrobe. The Rain Cloud laminate was chosen as a serene and subdued option that gives this master walk in an all-embracing, calming atmosphere. 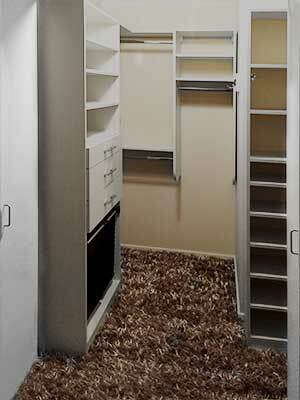 This closet uses every inch of available space and is built all the way to the ceiling with storage. 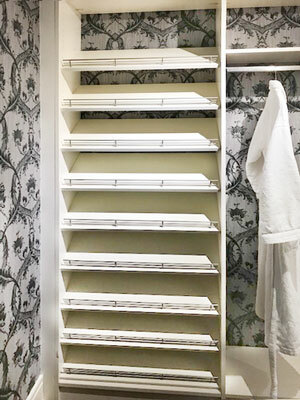 Rather than resorting to a step stool to reach the higher hanging sections of this closet, pull down closet rods were installed to aid in accessibility. 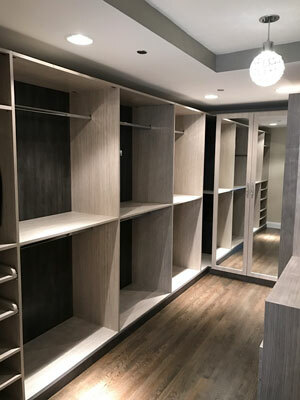 A great way to provide the functionality of a luxurious closet island in a walk-in that is too narrow to accomodate one is to install a custom closet island. 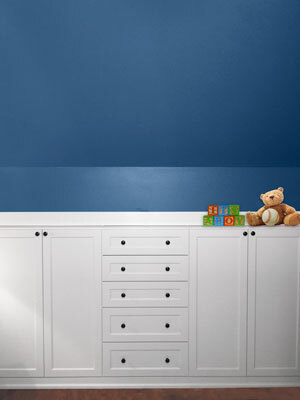 The closet hutch installs against the wall and uses far less space. 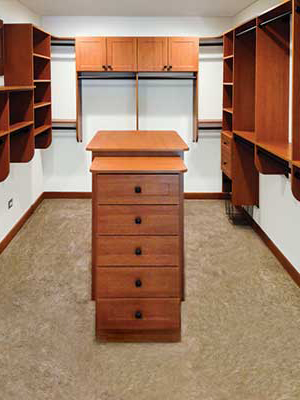 A bonus in designing a closet with a hutch is the extra storage provided by the upper cabinets. Greg designed this one with glass doors that keep everything enclosed and put away, yet still visible. The abundance of drawers for storage on the lower half of the hutch are perfect for jewelry, lingerie and other small items. Custom drawer organizers add further functionality. 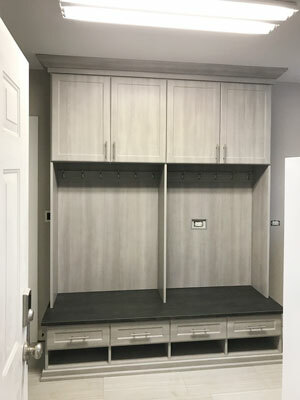 The countertop provides the perfect opportunity to personalize the space with decorative accents in this closet system. 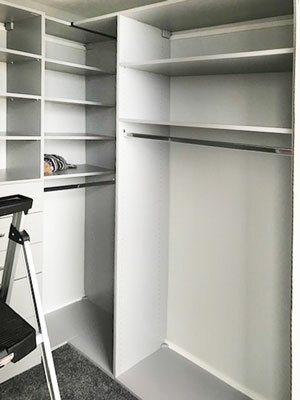 The combination of suspended and floor based components makes for a custom closet design with the most storage and functionality, a pleasing appearance, and best cost efficiency. This organization system includes many pull-out organization accessories like the Synergy pull-out closet laundry bags and Elite valet pole. Shelves, drawers and cabinets provide plenty of space to sore clothing, while the double rods maximize hanging space. The use of a closet hutch is a great way to add the functionality of a full closet island, without taking up as much floor space. 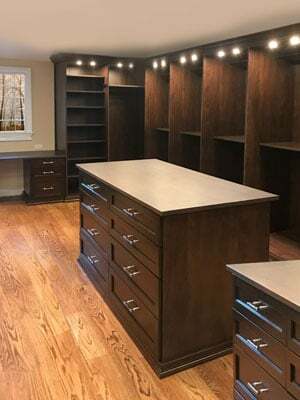 This one, in a light wood grain laminate, compliments the shelves and double hanging space, providing a place for everything this homeowner could wish to store in her closet. 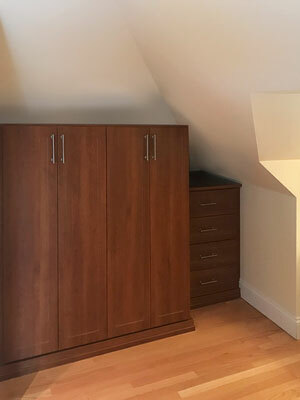 Adding a closet to a room with a sloped ceiling and walls can present difficulties under the best circumstances. This room originally had no closet, but had an alcove in the wall with heating pipes and controls. Adding access to the radiant heating system might make some designers throw in the towel, but Greg overcame all challenges with this beautiful and whimsical design. A 360 Spinner is practical in a number of ways. Not only does it conserve a great deal of space by fitting into the corners of the room, it makes organizing shoes and clothes unbelievably easy. This design contains two of them — one solely for shoes and accessories, and one for folded clothing. Various hanging rod sections are convenient for keeping different length and type of clothes easily organized. 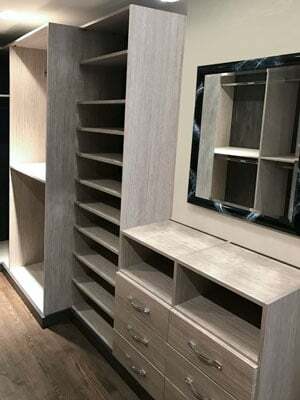 This custom walk-in closet is a sure success with Greg's ability to seamlessly meld varying textures in the room to become one beautiful and harmonious unit. His play of the dark wood floor with the light laminate results in an intriguing and playful contrast. The addition of custom crystal handles gives a sparkle to the imagination leaving this walk-in closet with a sense of wonder. This walk in closet with crystal accents has an exquisiteness that expresses delicacy and fine taste. 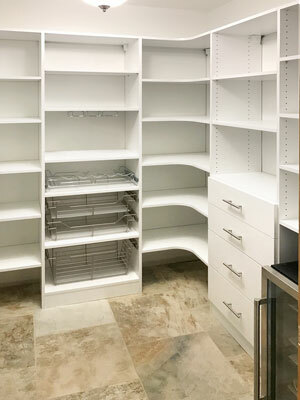 The organization system includes hanging, shelving for shoes and folded items, a closet island, and a closet hutch to take care of an extensive wardrobe. The unique combination of wood tones gives this space character unlike any other. A separate, darker toned backing creates a dynamic aesthetic in partnership with the light laminate. Hanging rods align the walls and full-length mirrored doors are strategically placed to open up the long and narrow space. In this design, a difficult space with uneven floors and sloped walls presented a challenge overcome by careful measurements and attention to detail. The resulting design is a rich and warm wardrobe that offers spacious cabinets for hanging clothing and drawers for folded items. 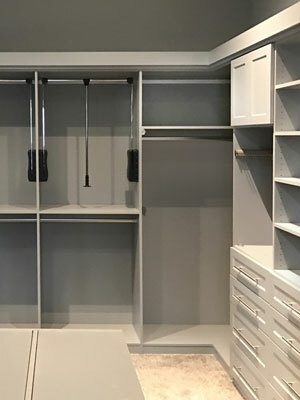 Greg designed this closet in a calming Rain Cloud laminate with polished chrome Novel handles and Shaker Mission drawer fronts. The design elegantly fills the space and maximizes storage using hanging, shelving, and drawer organization. 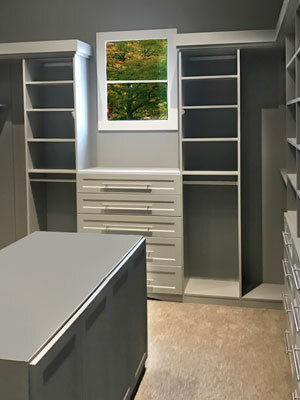 Another look of this Rain Cloud master closet design displays how corner storage is maximized using both spacious shelving and a short hang section. The design caters to all organizational needs for hanging and folded clothing. 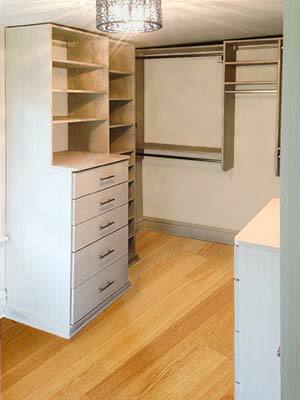 This custom closet system is built against one side of the room where no closet previously existed. It includes a built-in, shelf type ironing board and abundant cabinets to store folded items behind closed doors. This mud room organization system goes beyond the typical hall tree and incorporates closed cabinets with hooks for jackets and backpacks with open cabinet shelves on the end. The shelves are a perfect place to organize gloves, scarves, mittens and hats — folded or in baskets. 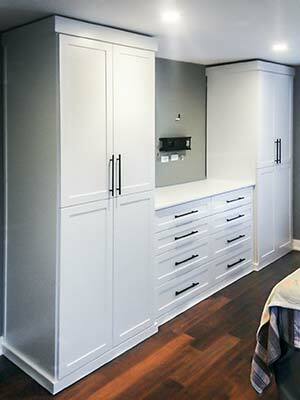 Attention to detail is evident in the construction and design of this closet system. The cabinetry is trimmed with an african walnut laminate as an elegant accent to the white cabinet doors. It makes a unique statement for the rear entrance of this home. 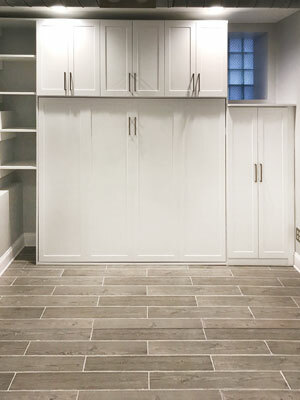 As a basement storage hub, this mudroom design offers a place for additional storage of outwear, shoes, games and snacks. The River Rock system has Aspen fronts and Bar handles for a transitional, not to mention just-plain cool look that combines nature with modern accents. The After Hours bench seat adds an elegant contrast and creates an engaging aesthetic. The lower level mudroom is a great place to store items less frequently used and still add a stylish touch to this part of the home. The unit was designed with the electrical wiring in mind, offering clear access to the outlet by using a silver outlet grommet along the backing. 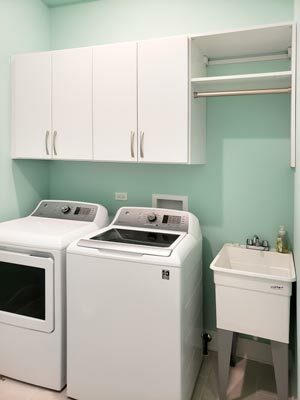 The addition of these laundry cabinets transform the room into an efficient, maximized, and beautiful space. Contempo faced cabinets with charming Curved handles give this design a modern flair as it allows the soft seafoam walls to stand out. Included in this laundry room design is a special wall unit with a desk-like space with a convenient countertop for folding. Space below the countertop offers room for a large basket to keep out of the way when multitasking in the room. The countertop is in our White Chocolate, adding a subtle variance to the beautiful design. 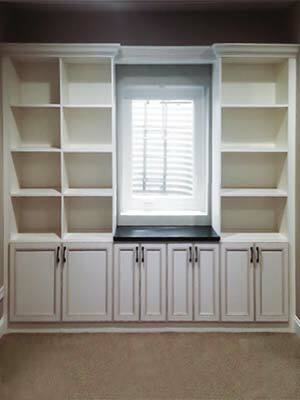 This wall unit was designed to add storage and functionality while enriching the basement space. This family has tons of storage space for books, movies, games and more on these expansive shelves and cabinets. Designed in a Winter Cherry laminate paired with oil rubbed bronze Moderne handles, the combination is lively and sophisticated. This media center system surrounds the hook-up for a large, flat screen TV in the center. It includes cabinets on either side to conceal the Blu Ray player, cabel hook-ups, audio equipment, home theater components and video gaming systems. The drawer section in the center and below the television is perfect for storage of CDs, DVDs, video games and any other item that is best stored out-of-sight. 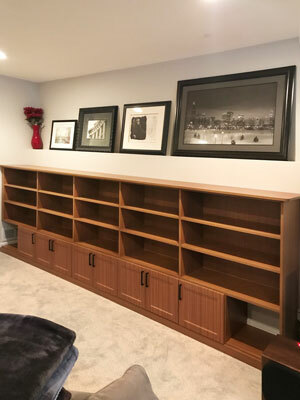 This open shelving style wall unit was primarily designed to hold a large collection of books in the family room, however, enough shelving space was added to accommodate photos and family memorabiia as accent pieces. 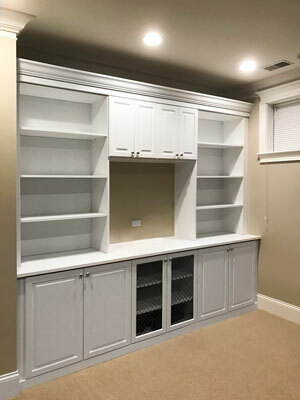 This multi-functional wall unit is a workhorse for this famiy room, handling storage for books, display needs and cabinets to conceal electronics and media center equipment. The custom storage unit was designed to surround an existing window. Difficult spaces are no problem at Closet Works. Greg designed this custom wall unit to fit suggly under the angled and sloping ceiling, adding valuable storage and functionality to the otherwise wasted space. The built-in look simultaneously modern and classic, with the dark laminate finish of the wall unit contrasting beautifully against the lighter hardwood floor. Simple bar style hardware completes the look. Mirror imaging a wonderous pyramid, this wall unit is a work of art. 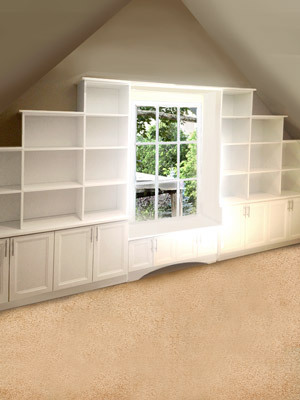 The different levels of spacious shelves balanced around the window offer areas to keep books, movies, photographs, and various home decor on display. 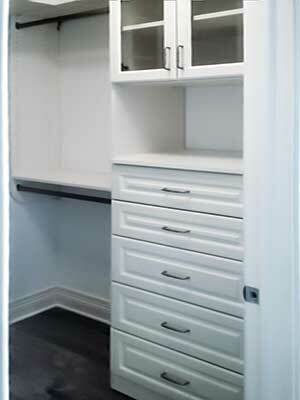 Also included in this organization system are lower cabinets with tons of storage space. The interesting step-pattern design plays well with the geometry of the room. 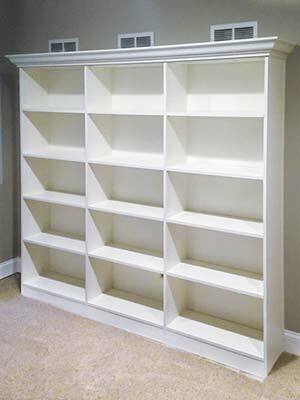 This wall unit is a simple and elegant solution to basement storage space. With Harmony raised panel drawer faces and an antiqued brass wire insert, the unit has a classic sophistication. The shelves are fully backed with an open center hutch for a small tv. This basement was an open book — welcoming organization systems to create a clean, fun, and safe play environment for years to come. 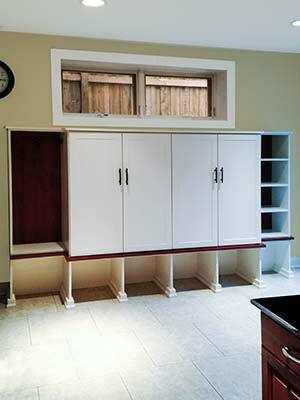 A long, Summer Breeze countertop becomes a bench seat above all cabinet storage. The design is in a white laminate to create a spacious and open atmosphere and to reflect the light that will come through the windows. 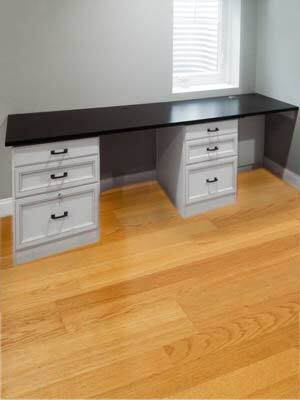 Multiple built-in desks provide dedicated space for a home office with areas for homework, studying or arts and crafts work. The queen size wall bed remains in the closed position most of the time, allowing a lot of open floor space. However, when a guest bedroom is needed, the Murphy style wall bed folds out and two pull-out bedside tables can accessed, creating a very comfortable guest bedroom. 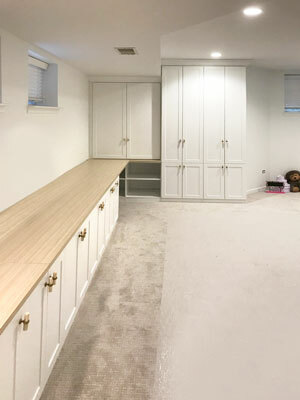 This space in the basement offered the perfect space for guest sleeping quarters and storage but due to sloping floors and other unlevel features, it required a fine-tuned design. 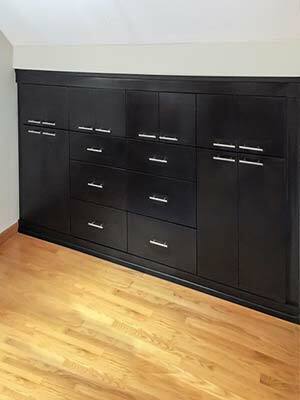 Greg designed this queen horizontal murphy bed design with precision and perfection allowing a beautiful design to come to life. 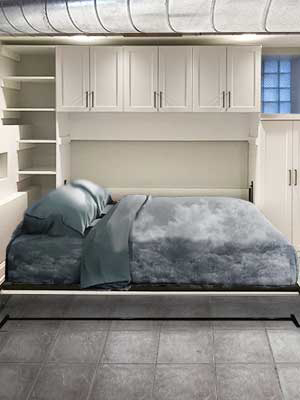 Despite constraints creatd by ductwork and basement pipes, this horizontal Murphy Bed opens up beautifully, adding an additional bedroom to the basement of the home that any guest would be lucky to enjoy. A home office doesn't have to occupy a separate room. 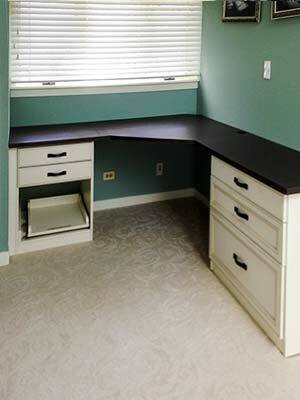 This home office provides a work area for up to two people in one corner of the family room. It's perfect for children doing homework, or providing Mom and Dad with a place to spread out and pay bills. 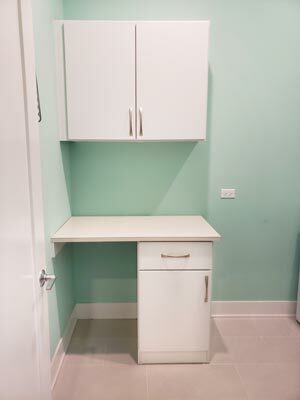 Although this corner desk unit is small, it handles a lot of tasks and offers quite a bit of countertop area in a small space. A pull-out shelf is included to hold the printer, allowing it to be kept tucked away but accessible for printing and maintenance. The Portabella Ivory desk is accented by a Cocoa laminate top, and blends seemlessly with the furniture in the rest of the home. A well organized pantry can do wonders for a family. Everything has a proper place and no longer will food be left to expire as boxes and jars are less likely to get lost in the mix. Curved shelves maximize the available space, providing a spread out layout for organizing items. Perishables and frequented snacks can be kept in the convenient pull out wire baskets lined with plastic. A wine rack is the perfect way to keep your glass bottles safe and easily accessible.